Chinese New Year looms large. As much as we look forward to the gathering of friends and family and celebrating with much feasting, we dread the inevitable consequences of that culinary binge. In the war against fat, festivals are potentially dangerous opponents which can take down our efforts unless we have a battle plan ready. In part 1, I shared a viable battle strategy that has worked for many of my clients in their war against weight gain and sugar overload during the CNY period. Stratagems fell into three categories. We looked at A: The Start of the Day and B:During Each Visit stratagems. Today we’ll look at C: Between Each Visit stratagems. I’ll also share some observations about what doesn’t work, and throw in a personal take on the importance of making choices in the context of living a Full Life. If you will be having lunch and dinner in addition to your visiting munchies, you need to decrease the amount of food to limit the daily number of calories taken in. It’s simple mathematics, yet people often forget this. Because visits involve tidbits rather than real foods, people often have the same regular meals for lunch and dinner. Remember: those calories add up! Even fresh vegetables could theoretically make you fat if you ate enough of them. So if you eat during your visits, you should eat less for your regular meals. Do not reduce all parts equally though! 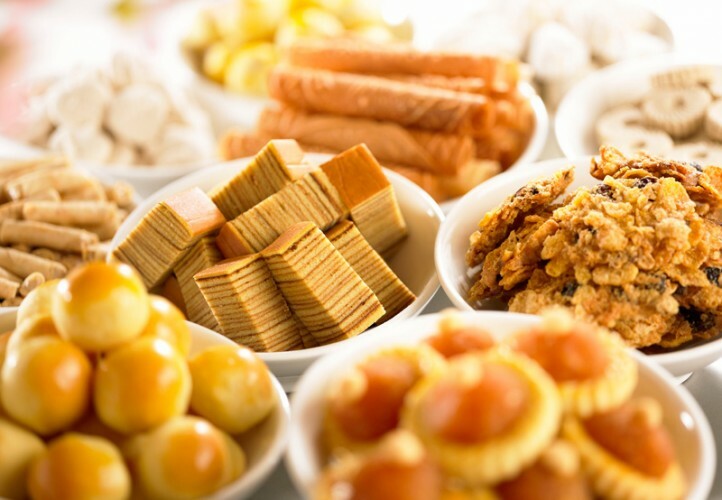 You’ve already had plenty of carbs and fat in your CNY goodies, but probably very little quality protein. Therefore if any quantity should remain the same during regular meals it should be protein. Protein also increases meal satiety, so it’s easier to reduce the amount of carbs and fat you consume in the same sitting. Needless to say, it’s quality low fat protein we’re after… not another piece of bak kwa! Between visits, get some exercise in based on available time and space. I always spend some time around CNY teaching my clients what I call HNR (Hit-N-Run) exercises, for them to sneak in whenever able. I’m going to be honest. It’s not so much that that extra 20-50kcal is going to make much of a dent in your caloric indulgence. However there are benefits both physical and psychological. Burning very few calories doing each individual set can still accumulate if you have the consistency and discipline to get as many HNRs as you can. It is a checkpoint for you, and keeps you in the mindset of exercising regularly even in all the hustle and bustle of CNY. It serves as a reminder to keep moderating your intake during each visit. It may help control appetite. I also strongly recommend planned workouts. That means a full training session. Now, I know it’s going to be really hard to amidst your other obligations during this busy period. But for some people, it is possible if they PLAN AHEAD. What I find is that many people didn’t even consider the possibility of allowing for this at all, and putting it on the table made them realise they actually could! Why do I recommend getting at least one planned exercise session on one of the two CNY public holidays? During the week, colleagues will bring food and tidbits to share. These jars on the table are always a temptation during tea breaks and meals. Don’t eat any of it. Simple? I believe if people just followed this one tip fastidiously, they’d save at least a third of the excess calories they take in during the CNY period. It’s the dangerous snacking, unplanned, unrecorded eating that does many people in. Near festivals, advice on fighting calories start appearing in magazines, newspapers and online. I’m going comment on some that don’t work well in my opinion. By all means try any if you think it might for you. After all these are inherently good ideas; it’s the failure of execution that’s always the problem. Near impossible. The smell of food itself has been shown to trigger appetite and cause salivation. And human nature is such that we’re always curious about what we can’t see, aren’t we? Facing away from the food often means facing away from other people too, and can be considered insulting to your host, so remember the purpose of your visit in the first place. While this might be a good idea at home, it’s impossible to choose the size of your plate when you’re visiting. Many people are too considerate to trouble their hosts and too self-conscious to call attention to themselves by asking their host if they have smaller plates available. Furthermore, I’ve observed that people who see neighbours with larger size plates naturally have a false sense of security that they are eating very little. So they feel less guilty about refilling those plates. I suggest you use whichever plate is available, and fill it up as advised in B2 in my previous post. It’s commonly advised to eat 5-6 smaller meals spread throughout the day instead of 3 large meals. Doing this might control appetite, keep blood sugar more stable, and increase metabolism through something called the thermic effect of food (basically you expand calories digesting your food). Unfortunately during CNY you’ve already got enough frequency, thank you very much! This is a period for you to minimize your feeding opportunities, not get any more helpings! This suggestion would have you showing up to a gathering with your own plate, healthy food option, etc. Some people even recommend bringing in a shaker bottle and protein powder. But let’s be realistic here. If you are going to several houses a day, and you’re taking public transport to boot, you’re not going to be able to have enough plates. Even if you took just one, that would require you to wash it at your host’s each time you leave a home. Too much trouble to sustain. Here are some additional ideas. Are there households you could visit that serve as a nexus around which most other people gather? In my own case, when my grandmum was still with us, we would go to her house as the first CNY stop because that’s where everyone was. In addition to saving time, it also saved more visits, each of them a calorie-loading opportunity. It’s the same thing with friends. Trying to celebrate together in one location really helps you save time and calories. If there are no options, why not offer yourself as a meeting organizer? One thing that might motivate you is creating a pre-festival record. Take pictures before the CNY period. Record your weight, or waist circumference. For clients I take skinfold measurements for areas of concern, such as triceps, thighs and waist. All this constitutes the BEFORE record. The best place to put it is on the fridge door because it may serve as a check. The second part of this idea has you doing everything again but after CNY. That creates the AFTER record. Compare the two. Few things motivate people more than seeing how they’ve let themselves go so quickly! Those are pretty much the tips as far as calories go. However I’ll end with a more personal view, speaking from the perspective of the AA35 philosophy and the big picture goal of living a Fully Life. Each choice you make in Life affects something, including that ultimate vision you have for yourself. Every choice adds up: what you decide to do, and what you decide not to do. That’s why we’re making a battle plan for CNY, which could apply to any other major festival involving plenty of eating. We know that all our decisions will have an effect on our health and physique. But please remember: there is a REASON why we want health and fitness. It’s a strong foundation, an enabler and maximizer for layering on the experiences that make Life worthwhile. We shouldn’t obsess over our fitness and physique goals in a vacuum. Don’t get me wrong now. It is important to eat correctly. You should try to contain the calories. But do it in a way that doesn’t impose on people, hurt their feelings, assume a posture of superiority, or make a spectacle of yourself. There is a purpose to celebrating occasions with loved ones, be they friends and family – shared happiness and lots of laughter. As such there is an emotive component involved in the eating activities. In particular, many festivals are a cultural thing which are very important to our elders, who should not be forced to adopt to your ideas and value concepts. Try to meet halfway, as with most relationship matters. At their age, they may not understand. And isn’t it important to give them happiness during this special occasion too? On the other hand, I see too many people – out of a sense of obligation or duty – going on visits they would rather not do. Seeing people they dread or even hate. That’s a waste of time, gives you negative emotions, and more calories. IF that sounds like you, ask yourself: Do you NEED to go? Case in point, I have stopped visiting some relatives – who used to look down on us because we were poorer – simply out of formality. If I have to gain calories which I require extra hard work to get rid of after, it will be as an acceptable trade-off because of the right people I love and want to celebrate with. Not a waste on negative people who shouldn’t matter. That would truly give EMPTY calories another meaning! Health and fitness is the bedrock for leading a full Life, but it’s a means to an end, not an end in and of itself. Happiness shared with loved ones is a very important aspect of a Full Life, and special occasions that bring families together a few times a year are just one such way it is shared. As long as you use at least some of the strategems in this article, you should keep your unhealthy calories to a minimum, and your readiness to get right back to it to a maximum. Go enjoy this time with your loved ones. Then, it’s back to the grindstone!